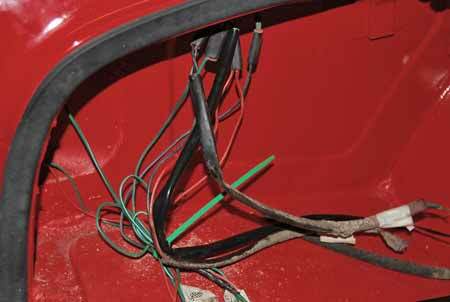 Anyone who has restored a car knows how paint over-spray can wind up on electrical wiring after a car body is painted. One way to get around this problem is installing a new wiring harness. But a new harness can cost hundreds of dollars, so many restorers prefer reusing the old wiring if it's still serviceable. The Triumph we were working on had nice wiring. From a functional standpoint, there was no need to replace it. And we wanted to stay away from installing a new harness if we could, because that can be a tricky and frustrating job if things don't go smoothly. The old harness was pretty nice, but the end sections were covered with Viper Red over-spray after the car was all painted. Actually, the wires themselves were not the color of the car. They were covered with back plastic sleeving and the paint over-spray had covered the sleeving with Viper Red paint. The black plastic sleeves were also part yellow (from over-sprayed primer-surfacer) and part brown (from dirt), as well as part red. The red wasn't consistent, either. In some areas the wires were bright red and in other areas they were kind of "speckled" with red over other colors. This section of the original sleeving had only a small amount of Viper Red over-spray, but it was very dirty and the black sleeving had dried out and cracked. It also has wrinkles in it from aging or from being heated up. Most of the over-spray was not on the wires, it wound up on the sleeving. Each sleeve had several wires running through it. In most places, the wires were cut off at the remote ends. That meant they could easily be slid out of the black plastic sleeves. There were a few wires that still had bulb sockets at the ends. These sockets would have to be removed before the wires could be sleeved. Then, the sleeves could be slid on and the wires could be spliced back together. 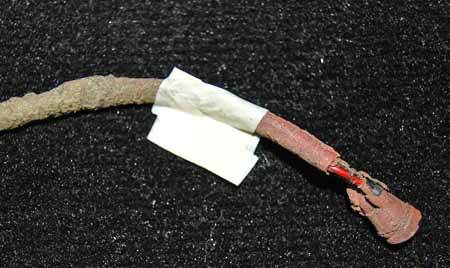 Here is a section of original wiring that had the light bulb socket cut off when it was removed from the car during its restoration. The wire sleeving is really ugly. When the new sleeving goes on some splicing will be required. This section of the old wiring still has the bulb socket attached. It is in bad shape and would have probably needed to be replaced anyway. This section of the old sleeving is also deteriorated beyond any possibility of cleaning it. 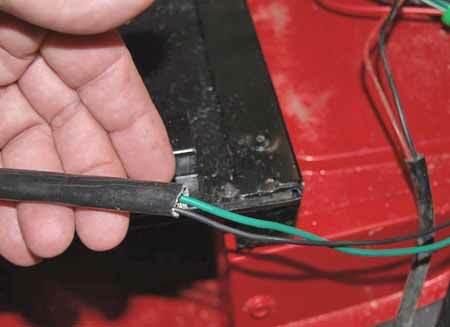 Even if a little bit of wire splicing was required, the work involved was not all that difficult. However, what turned out to be slightly difficult was finding the exact style of sleeves we needed to get the right appearance. There are plenty of different types of wire covers available at swap meets, auto parts stores and on the Internet, but none were what we needed to get that "factory original" look. Plastic spiral type covers that you twist around the wires from the side are one option. An advantage of this design is that you don't have to do any splicing to get the covers around the wires that still have bulb sockets attached. However, you definitely have to give up that original appearance if you use spirals. Another popular option today is flexible braided sleeving. Think of wrapping the wires in a spider web with a tight mesh. This type of sleeving can be expanded a bit, so in some cases you can work it right over bulb sockets. Once it is on the wires, the braided material tightens up again and gives you a nice clean appearance. Flexible braided sleeving looks great, but it wasn't used at the factory when they were building 1968 Triumph TR250s. A third option for covering wires is the split flexible plastic sleeving used om many late-model vehicles. 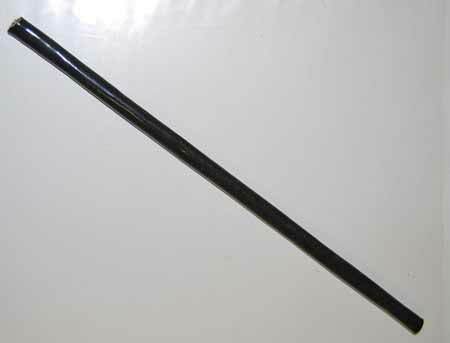 This looks like a miniature version of flexible exhaust pipe and comes in a variety of colors, although the most common one used is black. One side of the flexible sleeving is slit so that it can be pushed around the wires to cover and protect them. This also was not used in the '60s. We considered the idea of cleaning up the old sleeving and going with it again. For some reason, this worked very well on the wiring in the front of the car. Maybe the painter had done a better job of covering this or moving it out of the way when he was in the spray both, On the other hand, the wiring on the rear of the car (mostly in the trunk) would not clean up with paint thinner or acetone. This made sense for two reasons. First, the wiring in this area was closer and tighter to the sheet metal, so it would have been more difficult to move it out of the way when painting. Second, it appeared that the car had been stored outside for a while (before the project started) and that the trunk lid was probably left open. Water got inside and the trunk floor retained it. Therefore, everything under the car's trunk lid was in worse shape than everything under the hood. We checked the catalogs put out by British car parts suppliers such as The Roadster Factory, Moss Motors, Victoria British and Little British Car Company. Some or these offered a tape to cover the wires, but this was not the same as the sleeving that was on the original wiring. We also looked in some of the general parts catalogs and catalogs for American collector cars. No one seemed to handle smooth black plastic sleeving in the size we needed. At this point we remembered having picked up a small catalog featuring wire-covering products at the 2013 Hot Rod and Restoration Show (now called The Shop Show) in Indianapolis. 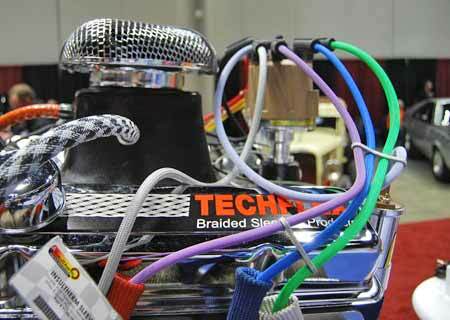 At that time, we had been looking for ways to dress up an old engine and to give its spark plug wires the look of the yellow, braided wiring used back in the 1930s. The catalog did have a flexible woven sleeving product that was close to what we wanted, but not exactly it. We couldn't find the catalog (hope we didn't throw it out) but after kicking in the old "hard drive" on top of our shoulders into gear, we recalled the company had a simple name that spelled out its purposeâ€”Wire Care. So, then we kicked up the hard drive in our desktop computer and used our favorite search engine to come up with www.WireCare.com, a company that bills itself as "the cable management superstore." Wire Care sells a lot of stuff that you can use to dress up cables, wires and plumbing. Its market goes beyond the automotive world to include things like computers and aerospace applications, but it's big on cars. The Wire Care booth at the hot rod trade show offered lots of wire sleeving products that hot rodders could use to dress up engines the way hot rodders like to do that. However, what we needed for our Triumph project was a smooth, shiny black sleeve that was pretty simple and plain. It also had to be the right diameter to match the painted up original sleeves. As you might guess, we found what we were looking for or we wouldn't be writing an article about it. Wire Care's item number SFAD 00BK is called Silicone Flame Retardeant Grade A Coated Fiberglass Sleeving, Black (8.38mm) and it was exactly what we needed. It comes in 5-ft. cuts and the price was $6.80. We ordered one cut and we were even able to pay for it with Paypal. The shipping was a little more than the cost of the product (which we hate) and we made the mistake of not ordering enough. In our second order, we got more than we needed (five 5-ft. cuts) and the shipping was only $2 higher than the first order. Here is a piece of the new Wire Care part no. SFAD 00BK Silicone Flame Retardeant Grade A Coated Black Fiberglass 8.38mm Sleeving which appears to be a perfect solution to closely replicating the original sleeving. Once the sleeving arrived it was easy to install on the wiring that had the bulb sockets cut off. We simply removed the ugly original sleeving and, used it as a pattern to cut the new sleeving to size and slid the new piece over the wires.. On the wires with bulb sockets, we will have to cut the wires, slide on the sleeving, splice the wires back together, use proper colored shrink sleeves to make a nice connection (Wire Care sells these, too) and pull the black sleeving down over the splice so that everything will look factory original again. It was easy to trim a piece of the new sleeving to the same size of the old piece by using the original as a pattern. Then, the new sleeving was simply slid over the wires that were open on the end. Here is one piece of the new sleeving installed next to several pieces of old sleeving. Our first order was short of what we needed to cover all the wires since we wanted to see how the sleeving looked before ordering more of it. At the 2013 Hot Rod &AMP; Restoration Show (now called The Shop Show) Wire Care had this display of the Techflex braided sleeving it sells for hot rod, high-performance and racing car and motorcycle applications. We ran across Wire Care when we were looking for a way to dress up spark plug wires on an old 1950s engine. 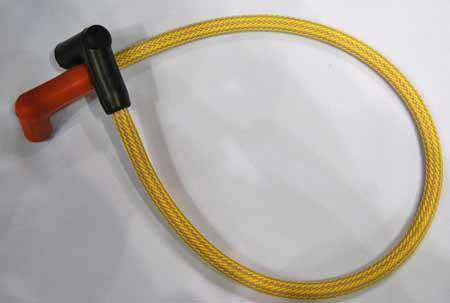 This yellow braided sleeving was pretty close to what we wanted, but we wanted an exact match at that time. 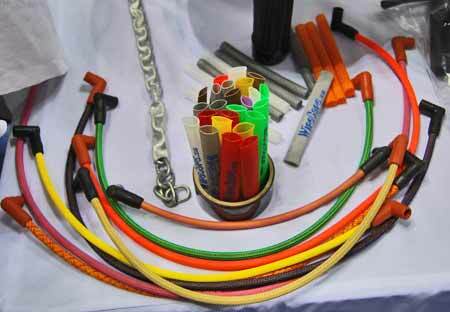 Wire Care exhibited a lot of its products at the trade show including colored spark plug wires, different color spark plug boots, multi-colored shrink sleeves, and some tools that come in handy for installing its products. 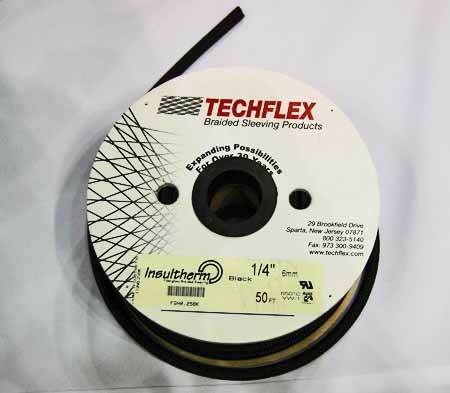 Also available from Wire Care are Techflex Braided Sleeving products such as this Insultherm™ black sleeving. Techflex, of Sparta, N.J., was actually formed way back in 1965 and is celebrating its 50th anniversary this year.